Many readers think that we only do 3D digital modelling and rendering. This is not true. Studiorola, is first and foremost Industrial Design-related. Because of that, we are able to take on project works related to Concept Ideation and Development of Product Designs. Why the need for Industrial Design? Industrial Design is much more than just making pretty product renderings. It can help in refining and further enhancing the potency of an idea. It can also provide added value, enhanced user experience and give visual appeal to a product. By the sensitive deployment of form and visual cues, Industrial Design allows the end user to better understand how the product is to be used. By using appropriate design language, it also helps in targeting the product to its intended user market group. For this phase of work, our typical process involves presenting hand drawn sketches to quickly communicate the ideas and concepts. Each assignment will consist of multiple concepts of which the amount is dependent on clients’ requirement. 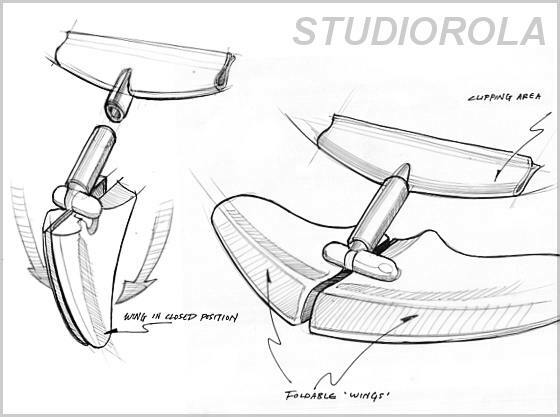 Below is an example of a typical concept being communicated as a hand drawn sketch. Clients that Studiorola designer had worked for include companies as well as individual inventors. Studiorola is not limited to doing pure styling. There were instances where the client required inputs in the form of innovation (in addition to aesthetic refinement). An example of such a scenario is when the client had a general idea for a product but wishes for someone to help in putting the idea into a more tangible solution. For this kind of situation, we may be of help. Hope that this short introduction adequately described what Studiorola can offer in terms of concept development. Please feel free to contact us if you have any queries.